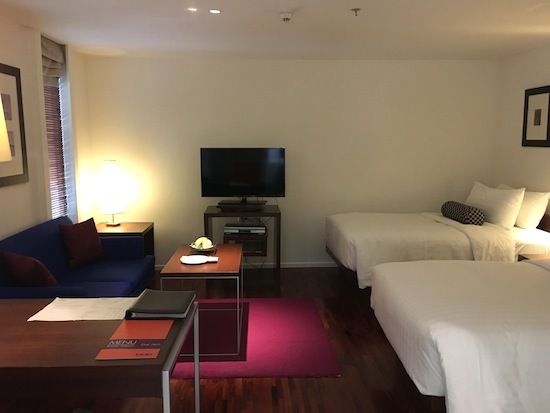 The stylish and very cushy rooms at Triple Two Silom represent terrific midrange value in an excellent location, especially if booking online. You probably won’t do better than this if seeking plush digs for under 3,000 baht a night in the heart of the Silom area. Average rating 8.5 from 865 reviews. A spinoff of the neighbouring Narai Hotel, which is far older and more boring, Triple Two Silom aims for younger midrange travellers who appreciate a splash of colour. The three-storey hotel stretches back for a long way off the street, with corridors and lounges sporting modern crimson and midnight-blue sofas, soft lanterns and abstract art in bright orange, red and purple. The whole place is spotless, touched with a subtle scent of lemongrass oil, and WiFi is free. Tough to beat this location. All rooms come with plenty of space and almost feel more like modern studio apartments. Tall windows allow a fair amount of natural light to reflect off the white walls, glossy hardwood floors and tasteful framed art. Sofas, coffee tables, large desks, minibars, safes and 40-inch LCD TVs with DVD players (a selection of movies is free) are set up across from beds with soft mattresses. 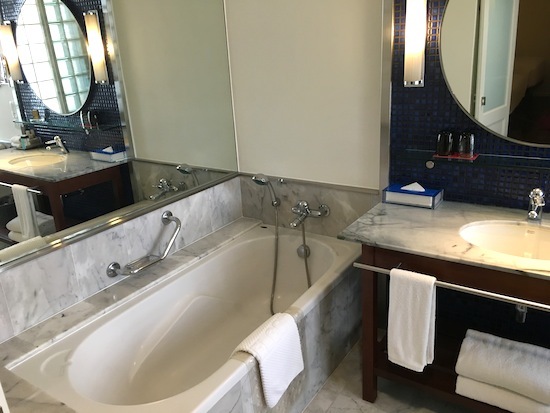 Spacious marble bathrooms come with tub on one side, partitioned shower on the other, and sink fronting indigo tiles in-between. These rooms are nothing short of luxurious. As walk-ins we were quoted 3,500 baht for a “deluxe” room with the 450-baht buffet breakfast included; but on Agoda and the hotel’s own site we noticed the same room type going for as little as 2,100 baht without breakfast. Pay no attention to the rack rate, which is listed at 6,500 baht a night in the hotel’s brochure. While the walk-in rate is very reasonable, the online rates are phenomenal for the quality and location. Do however expect these to fluctuate at different times of year. The hotel has a very professional atmosphere. Neatly dressed English-speaking receptionists greeted us with smiles and were happy to show us a room. On-site facilities include a large business centre, an open-air beer garden and tapas bar out front, and a garden footpath stretching between the two long and narrow wings out back. The lift and all rooms can only be accessed by key-card and a 24-hour security team keeps watch out front. A bath after a long day of exploring the city? Guests are also welcome to use the swimming pool and fitness centre at the Narai, which is no more than 15 steps across the parking lot. The location, midway up Silom Road, is outstanding. 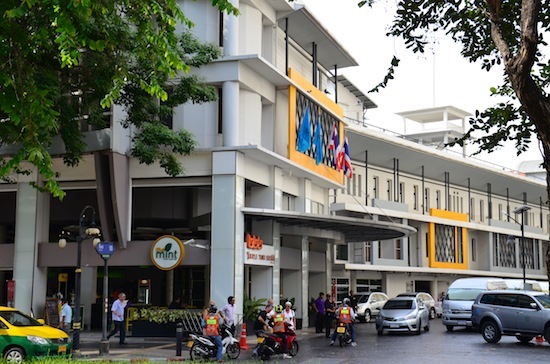 Chong Nonsi and Sala Daeng BTS stations are both easily reachable on foot to the west, while a bunch of art galleries and the riverfront can be reached after a manageable walk to the east. All sorts of restaurants, street food and nightlife abounds in the area. If you’ve more cash to spend, you might look into The Sukhothai, Mode Sathorn or Siam@Siam. Cafe Ice Residence isn’t a bad option for something more intimate, while Silom One Hotel puts you closer to the skytrain. For less cash, you could do worse than Luxx Boutique Hotel on nearby Decho Road, or The Inn Saladaeng. Check rates at Triple Two Silom on Booking.com.